In this issue, we have articles aimed at providing you with some great ideas for a happy, healthy environment for both you and your pup. Planning on planting a garden this year? Our article on dog-friendly landscaping on page 36 will help you to choose plants that not only look beautiful, but are safe for Fido. 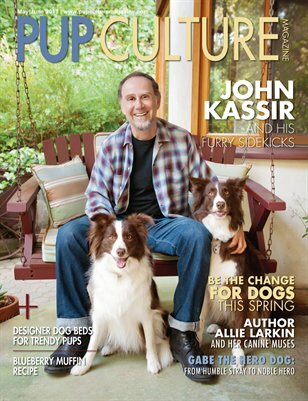 While you’re at it, check out our article on page 48 for instructions on how to make your own dog-friendly herb garden.We are pleased to introduce you to actor and comedian John Kassir, who plays one-half of the two-headed giant in the recent film, Jack the Giant Slayer. John lives with two funny and adorable Border Collies, Duncan and Fig. You can meet them on page 26.